Worship Tabernacle will like to invite you to our first Wednesday Service in 2019 – and what better way to start than to talk about LOVE. 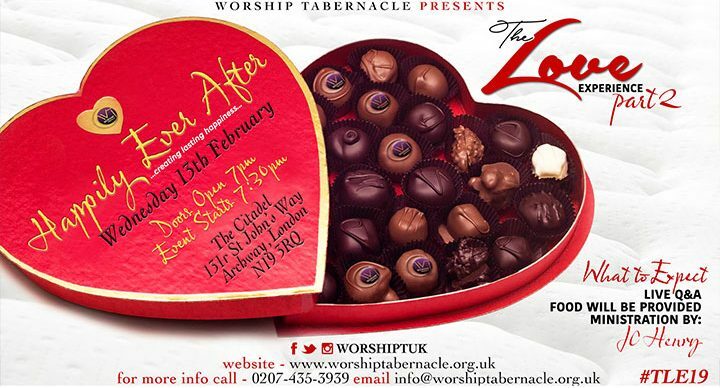 This Valentines Day themed Service entitled The Love Experience (Part 2): Happily Ever After, is going to be packed with fun, food, laughter. Q&A and yes – the word of God. Invite a friend, family member or colleague. You can expect a warm and friendly greeting at the door and be rest assured this service is going to be one not to be missed.